The SMOK Fit Kit is a high quality all-in-one vaporizing system that is backed by a 250mAh rechargeable battery and easy to refill SMOK Fit cartridges. 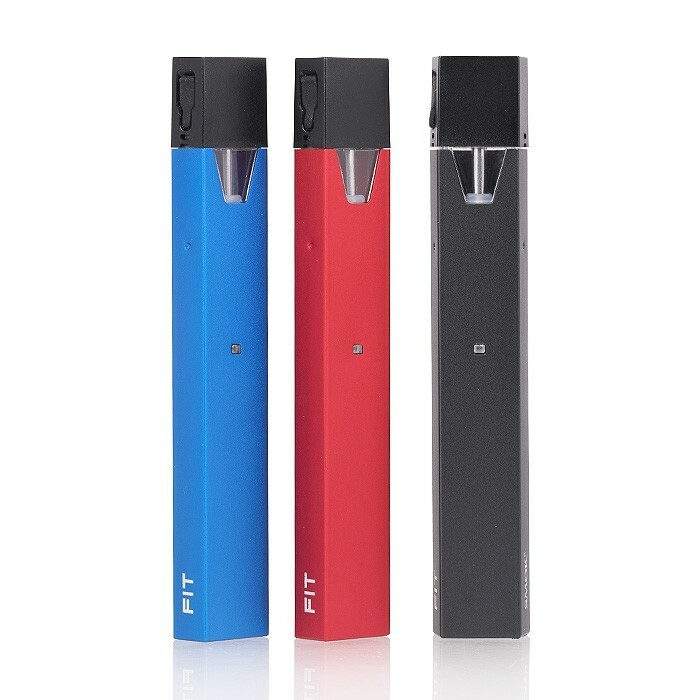 Furnished with a simple draw to activate firing system and backed by protection features such as an intuitive LED light battery life indicator and more, the SMOK Fit Kit is a top contender for any vaper looking for a device that is built for great performance when used with high mg nicotine salt juices. The SMOK Fit Kit is constructed from superior grade aluminum alloy for a superior device that features incredible durability. Lightweight in design and coated with a vibrant paint finish, the SMOK Fit Kit is built to withstand the wear and tear that comes with daily usage. Pen-like in shape with smooth lines and rounded corners, the SMOK Fit Kit is an ultra-portable and discreetly shaped device that is ideal for on-the-go vaping.An all-in-one vaporizing system, the SMOK Fit Kit is specifically designed to satisfy the needs of the daily vaper who prefers a mouth-to-lung vaping experience. Its cleverly designed features have been perfected for top performance when used with high mg nicotine salts, which are specially formulated vape juices that deliver nicotine to the bloodstream at a much quicker rate than conventional e-liquids. The perfect platform for nicotine salts, the SMOK Fit Kit delivers a truly satisfying nicotine hit at a lower power setting and at a much more discreet cloud output performance. The SMOK Fit Kit utilizes the SMOK Fit Replacement Cartridge System, these cartridges feature a 2ML vape juice capacity, with a built-in mouthpiece and are easy to refill when needed. The cartridge is press-fit for a secure placement into the SMOK Fit battery base. It features a single vape juice chamber with a secure rubber cover for mess-free use. If refilling a new cartridge, please let the device “sit” for 5-10 minutes to allow the vape juice to fully saturate into the cotton wick before use in order to avoid burnt tasting hits. To take the guesswork out of vaping, the SMOK Fit Kit is outfitted with foolproof protection features such as a smart LED light battery level indicator that is located at the front of the device. Along with this feature the SMOK Fit also has an 8 second cut-off to protect the battery from overheating, along with short-circuit protection and low voltage protection. To recharge the SMOK Fit Kit, use the included micro-USB port and plug it into the micro-USB port, which is located at the bottom of the device. It can either be plugged into a computer or can be used with a compatible micro-USB adapter (sold separately) and plugged into the wall. Built with extraordinary features, exquisitely designed with a simple two-piece construction and made for use with nicotine salts—the SMOK Fit Kit offers the ideal vapor device for those who are in the market for a well-built and versatile vaporizing setup that delivers a satisfying mouth-to-lung feel and one that’s available at a wallet-friendly cost.